Xiangjin Shen is a Senior Economist in the Financial Stability Department. Her policy work focus on the financial stability and macro-economic stress testing issues. Her current research interests include econometrics, monetary transmission mechanism, bank funding transfer pricing, stability of clearing agencies and tail risk. 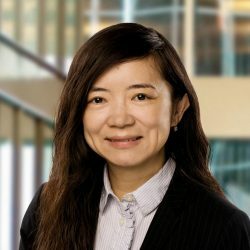 Before joining the Bank, Xiangjin worked as a Senior Manager in the Global Risk Management department at the Bank of Nova Scotia. Xiangjin received her PHD in Economics from the Rutgers University. We explore properties of asymmetric generalized autoregressive conditional heteroscedasticity (GARCH) models in the threshold GARCH (GTARCH) family and propose a more general Spline-GTARCH model, which captures high-frequency return volatility, low-frequency macroeconomic volatility as well as an asymmetric response to past negative news in both autoregressive conditional heteroscedasticity (ARCH) and GARCH terms. "Comparison of Bayesian Model Selection Criteria and Conditional Kolmogorov Test as Applied to Spot Asset Pricing Models"
(with Hiroki Tsurumi), Communications in Statistics - Theory and Methods, 2013, 42(9):1599-1617. "Does Aggregate School-Wide Achievement Mediate 5th Grade Outcome for Former Early Childhood Education Participants?" (with Stephanie Curenton and Nianbo Dong), Developmental Psychology, 2015, 51(7):921-934.